Athletes of all stripes can benefit from a little music. Nothing brings motivation, inspiration and harmonious muscle movement like a favorite tune. Since the inception of the MP3 player, athletes have had a lightweight, convenient solution to carry onto their playing field. Unfortunately, many bicyclists have been left behind. While MP3 players are certainly a better option than a Discman strapped to the handlebars, the headphone wires are a bit annoying and cumbersome. They risk getting caught up in the bike or slapping one in the eye on a fast, tight descent. Moreover, headphones drown out outside noises that might be imperative, such as honking horns or a dirt bike bearing down from the blindside. So bike riders can either risk the discomfort and tragic consequences of MP3 players or ride in silence. Since bike crashes tend to hurt just a little, the latter is often the safest route. 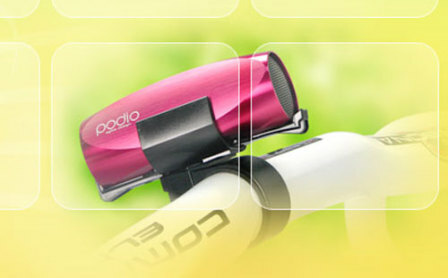 The Podio eliminates the need for decision and allows a comfortable, portable MP3 solution designed specifically for bikes. Straight from Taiwan, the Podio mounts directly to your handlebars and includes built-in amplification and speakers so that there's no need to sport headphones. Just don't play anything too lame and embarassing because everyone around you will be able to hear it. For those days where you just crave a little Burt Bacharach, the Podio does have a headphone jack. This little bike radio is just 88 millimeters long and 139 grams so it integrates seamlessly with most any bike. The Podio includes 2 GB of storage and supports WAV files as well as MP3s. The rechargeable lithium ion battery gets up to 20 hours of play time--so your average ride around the neighborhood is more than covered. A quick search reveals that the Podio is being sold on Amazon for around $25. The company also promises you'll get an "imbued aroma" with each and every Podio. Score one for your team! A Funny Thing Happened On The Way To The Gulf Oil Spill- YouTube Tonight! Another stupid device for people who force others to listen to their stupid music. Oh, I'm so angry all the time at those pieces of trash aka street racers. Yeah, I'm not a big fan of the bass rattling my walls from two streets over either--especially when the dude who walks out of the car is like 37. High school's over, time to grow up a bit. I think this bike player will lack a little of that booming bass, and no sign of a stupid motorcycle-muffler either. Hey Chris, I ride a cruiser motorcycle and have very quite stock pipes on my bike. Those losers with the really loud pipes are insecure low self esteem momma boys deep down inside. They need all the attention they can get. Real bikers don't need all the noise and black leather and logos. We ride to get away from it all... not to be the center of attention. I apologize if my first comment reply wasn't clear. Nothing wrong with motorcycles. I don't even mind a loud vehicle, if that's just the way it is designed. The after-market muffler modification is what drives me nuts. I definitely agree with low self esteem momma's boys--good call.